Just west of new luxury high rises on Biscayne, a row of white tents sprang up on the corner of NW 2nd Ave. and 10 St., smack dab against a patch of young collard greens. Underneath the tents, farm fresh fruits and vegetables were arranged on tables. 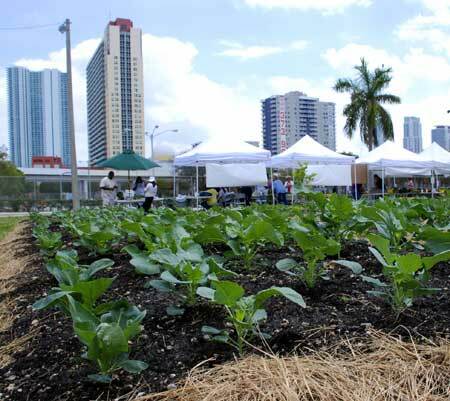 The newest farmers market was launched on Wednesday in Historic Overtown, one of the oldest and underserved neighborhoods in Miami. If people couldn’t come to market to get much needed produce, well, the market was going to come to them. There hasn’t been an actual farmers market in downtown for decades. Locals checking out and buying from Redland Organics. Two local growers were at the Roots in the City Farmers Market. Farmer Margie from Redland Organics put out a colorful display of radishes and white Asian salad turnips, carrots and celery, Asian greens, loquats, canistel and black sapote. Under the next tent, farmers Teena Borek and her son Michael from Teena’s Pride Farm brought tomatoes, red bell peppers, white eggplant that looked like bowling pins, and bunches of greens. 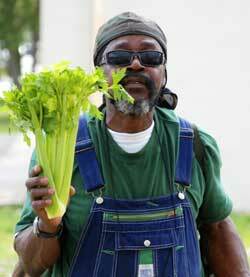 John Lealand Laundry likes celery. The market was open from 1 to 4, and there was a fairly steady trickle of curious neighbors wandering over. A lot of looking, a bit of curious sniffing and tasting, but mostly people were excited that a farmers market suddenly appeared on their street. People bought a few things, choosing carefully. One resident told me that there are several groceries in the neighborhood, including a Winn Dixie on the other side of I-95, but produce is very expensive. Some neighbors paid with cash and some were happy to find out they could use food stamps. That was the best part, the most amazing thing. The Roots market is set up to accept food stamps (also known as Supplemental Nutrition Assistance Program or SNAP). Even better, the Roots market has implemented a Double Value Coupon Program that would double the value of a person’s food stamp purchases. For example, if somebody bought five dollars worth of veggies, they would get that equal amount in tokens they can then use to buy more food at the market. This bit of shopping ingenuity and the Roots market came about from the collaboration of many entities. 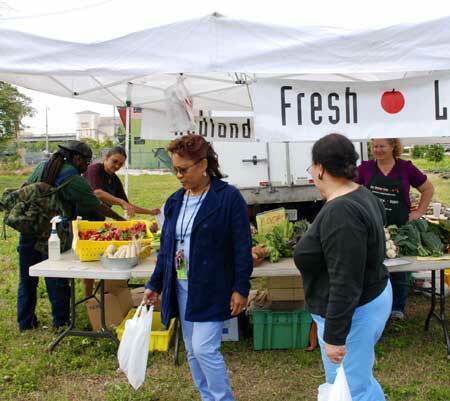 The Wholesome Wave Foundation has set up similar “Nourishing Neighborhoods” programs at over 80 farmers markets around the country, and provided leadership, training and seed money. Health Services Coalition handled the actual SNAP transactions, acting as a go-between the farmers and the buyers, and is putting the word out in the community. Michael’s Genuine Food and Drink enlisted Margie and Teena, the first two local family farmers to participate, and helped with fundraising and promotions. 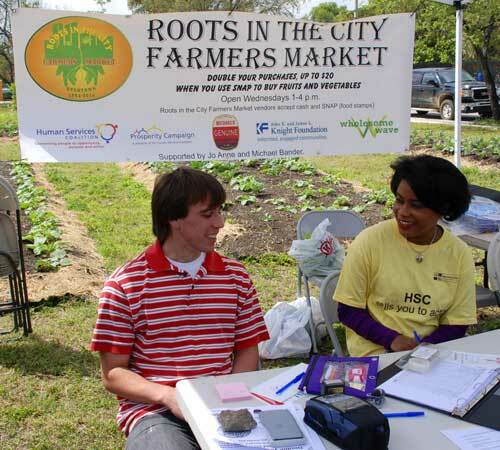 And the Roots in the City community garden (which is raising nearby collards, and has two acres of garden in the immediate area) offered space for the market, and added its produce to sell. People from HSC on hand to handle SNAP sales and manage tokens. The Roots market will have a dedication ceremony in two weeks, on Wednesday April 7. Miami Mayor Tomas Regalado has been invited, and there will most likely be other dignitaries attending. The market will run for four weeks, with maybe an extension for four more, and is scheduled to resume in fall. 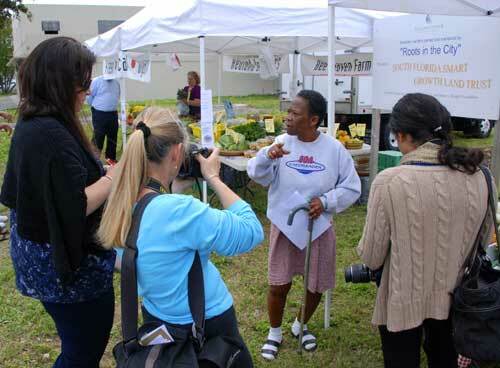 Listen to Low-cost produce comes to Miami’s Overtown, the WLRN report by Joshua Johnson, here. The Genuine Kitchen has posted the press release (with lots of good information) here. And Mango & Lime posted her report on the market opening here. Miss Sarah tells it like it is to the media.